Everyone knows that you can earn frequent flyer miles by flying, and if you’re serious about collecting miles you probably also know that using a rewards credit card is a great way to earn while you’re on the ground. What you might not know is that there are a lot of other ways to earn, too. According to the first RewardExpert Mileage Booster Study there were over four million miles up for grabs through special promotions in the first six months of 2016. How do you get your hands on some of those miles? You can get bonus miles for all sorts of things, including hotel stays, car rentals, cruises, vacation packages, shopping, credit cards, dining, taking surveys and even switching energy providers. But some offers are more lucrative than others, and some airlines give away more miles. Read on to find out what you should be looking for and where to find the latest offers. You’ll be earning some easy bonus miles in no time. Hotel and car rental offers are, by far, the easiest to find, but the most valuable deals are for airline flight, cabin class and mile-purchasing bonuses; credit card sign-up offers; and for booking cruises and other vacation packages. 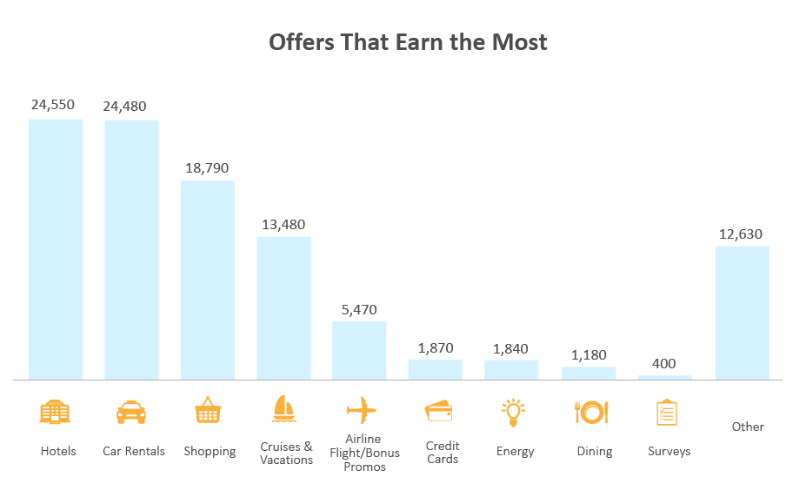 Hotel promotions accounted for more than half of all the offers tracked by the study, and they were worth about a quarter of all the miles that were available. That means that they were the easiest offers to find. On average, these deals were worth about 1,800 miles each. Most hotel offers involve an airline partnering with a particular hotel brand, like Marriott, Hilton or Best Western, and giving away extra miles for stays for a certain length of time or during a certain time period. The next most common category, which made up about 15 percent of all offers, was car rentals. Most car rental companies, including Enterprise, Hertz, Avis, and Dollar, have partnered with a variety of airlines to give away miles for rentals. Sometimes you’ll have to rent for a certain amount of time or during a certain time period to get the full bonus. Over the last six months, those deals were worth an average of 1,200 miles each. 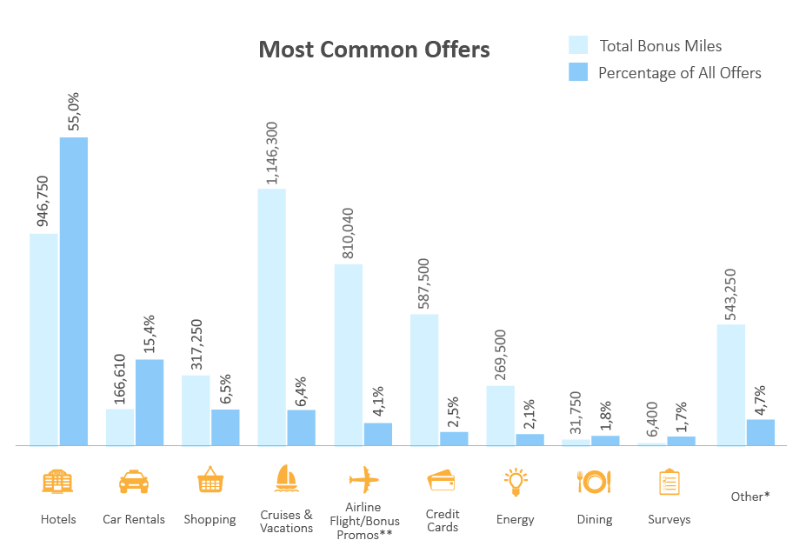 The most valuable offers out there, measured by the average number of miles available, were for airline flight and other bonus promotions, credit card offers, cruises and vacations and deals from energy companies. They accounted for only 15 percent of all offers, though. They may be worth a lot, but they’re harder to find. On the high end, airline flight/bonus promos, which include offers for flight, cabin class and mile-buying bonuses, were worth an average of about 25,000 miles each. Deals from energy companies, which include bonus miles for switching providers and installing solar panels, were worth an average of about 14,000 miles. The credit card offers that were tracked were exclusively for sign-up bonuses. Typically you have to spend a minimum amount of money within the first three months of having a card and then you’ll receive a bonus. They’re usually worth anywhere from 5,000 to 60,000 miles, and the average bonus during the survey period was about 24,000 miles. Sometimes there are extremely lucrative limited time offers, though. The Chase Sapphire Reserve card, for instance, currently has an impressive 100,000-point sign-up bonus. Grab that one while you can. Chase Ultimate Rewards points can be transferred to seven different frequent flyer programs. Cruise and vacation offers, which were worth an average of about 19,000 miles, can involve either booking with the airline’s partner or directly through the frequent flyer program’s website. If you’re planning a cruise, it’s worth checking if your favorite airline is a partner. Vacations typically involve a package deal that may include airfare and a hotel, or an all-inclusive resort. Look for offers from the three big domestic legacy carriers and their partners. 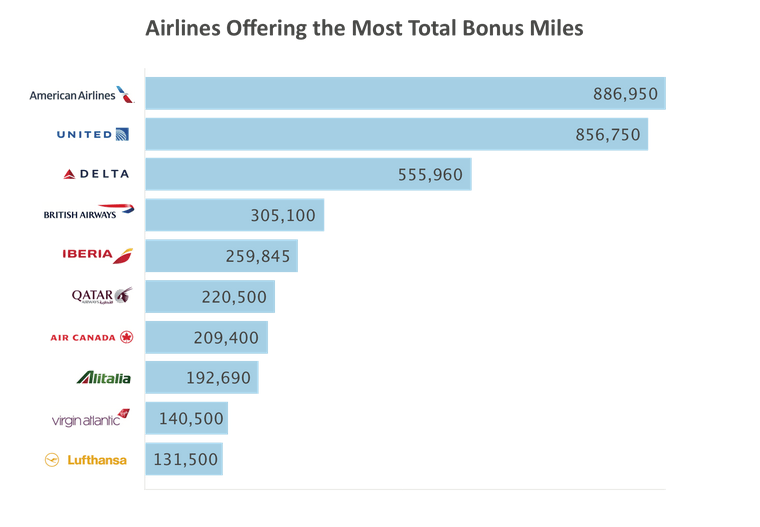 American, Delta and United gave away just about half of all the bonus miles that were tracked in the study. In fact, they were the only domestic airlines to crack the top ten carriers offering the most miles. Here are the latest offers from American, United and Delta. American and United’s offers were typically the most valuable, too. On average, American’s deals were worth about 15,000 miles each and United’s were worth about 12,000. Delta, along with the low-cost airlines Virgin America and JetBlue, were the only other domestic carriers who made the list of airlines offering the most valuable deals. In other words, special promotions from those five domestic carriers are more likely to earn more miles than from other U.S. airlines. 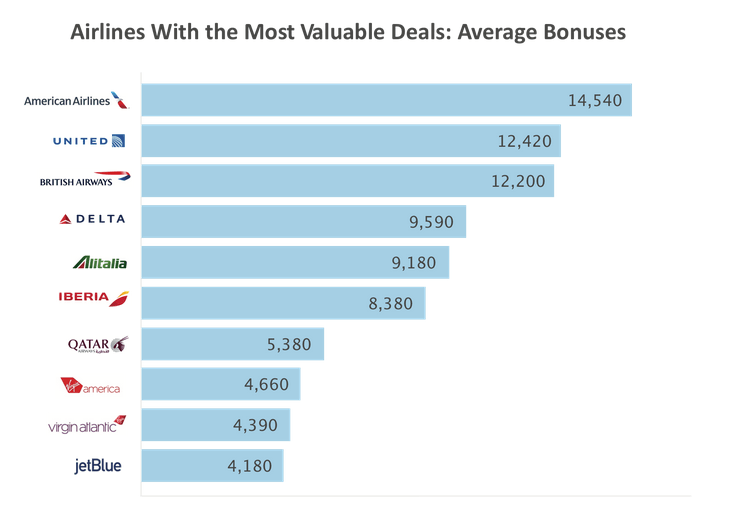 British Airways, Iberia, Alitalia and Qatar filled out the top ten airlines with the most valuable offers, as well as being among those giving away the most miles overall. RewardExpert archives mile-earning promotions and posts new offers every day. Just go to the RewardExpert blog and select earn from the menu on the left, or click here. And if you want to see the offers from just your favorite airline, simply choose the frequent flyer program’s name from the drop down menu on the left.